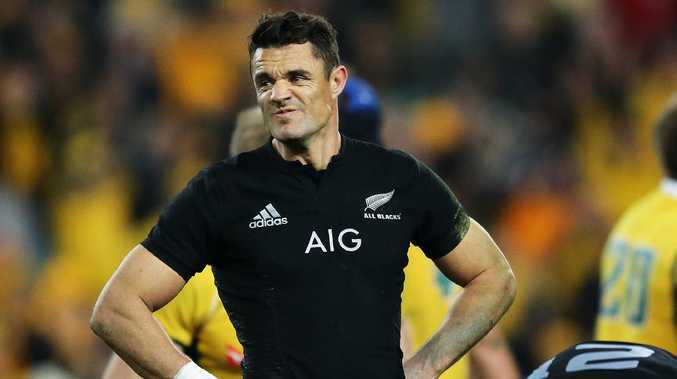 All Blacks great Dan Carter admits the end is nigh. However, a bulging disc in his upper spine proved problematic when Carter underwent medical testing at the Paris club - where he played three seasons after retiring from Test rugby in 2015. The record Test points-scorer said the injury had plagued him for several years and may require surgery. "But I wasn't cleared to play, so it's a blessing in disguise because I get to spend more time back here in New Zealand," he said. "I don't have a lot of rugby in me but I'm still loving it and enjoying it, so I guess this long break has helped me to phase into life after rugby." Dan Carter and former All Blacks captain Richie McCaw perform the haka during a Bledisloe Test against the Wallabies in 2012. Carter still has a season to run on his contract with Kobe Steelers, who he helped steer to the Japanese Top League club crown in December while being named the competition's most valuable player.